From a zero waste perspective, we couldn’t have started off our trip in the South Island in a better place. 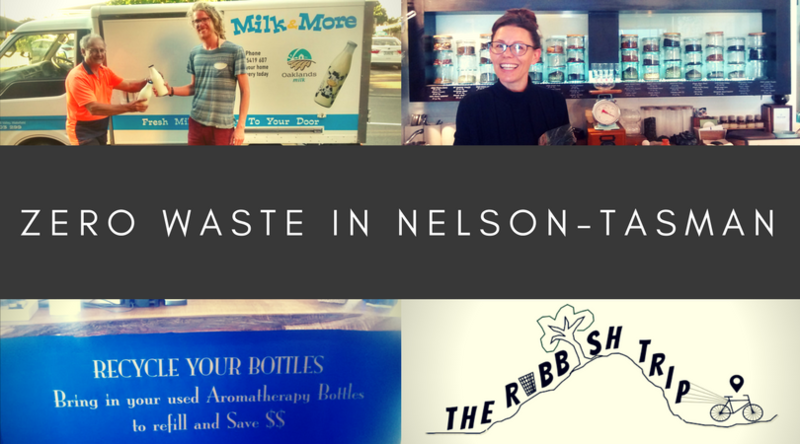 Nelson and Tasman are full to the brim with amazing businesses, organisations and community groups to get you well on your way to zero waste living. So much so that this guide is HUGE and perhaps a bit unwieldy… sorry! To make the guide more user-friendly, we have decided to divide the shopping section in two – a Nelson City guide and a Tasman District guide. We have followed the territorial authority boundary areas, which means that the division may seem a bit artificial and not fully follow your own shopping habits (for example, many Nelsonians shop in Richmond, which is in Tasman District, while many people in Tasman District do their big shops in Nelson), so you’ll probably want to look at both guides. As many community groups and council services cross over the whole region, instead of dividing these into the two guides, we’ve listed these together on this page (scroll down to have a look); we’ve kept the other posts purely about shopping. We hope that you find this guide useful. As always, we note that while we have done our best to get across as many businesses, local groups and services as possible, we may have missed some. So please feel free to leave us a comment or a suggestion if we’ve missed anything off, and we’ll add it in! Food waste – food waste and scraps going to landfill not only produces methane, but also represents the loss of an excellent resource that could be turned into compost to enrich our soil, or, if the discarded food was still edible, the loss of perfectly good food that could go to someone that wants to eat it! If you would like to set up your own home compost, worm farm or bokashi system so you can deal with your organic waste at home, the Nelson City Council and Tasman District Council have great info and resources on their websites to help you set a system up and they both offer all residents a $20 subsidy coupon that you can put towards a new compost/worm farm/bokashi system (with participating retailers). Alternatively, Nelsonians can make use of the newly established Community Compost – an organisation that will pick up your food scraps and take them away to compost for you (this service is available to both individuals AND businesses). If you are a Nelson business chucking out food that is still edible but not saleable, you can get in touch with Kai Rescue (run out of the Nelson Environment Centre) – an excellent initiative that takes from businesses edible food that would otherwise go to waste, and redistributes it to people who need it. E-waste – electronic waste is the world’s fastest growing waste stream, with huge environmental implications because of the toxins that can be leached from this waste, but also the loss of incredibly precious resources embedded in these items that are not recovered when the waste is dumped in landfill. Rather than throwing you broken electronics out – have you considered trying to get them repaired first? You could pay someone to do it, or look out for Repair or Fix-it Cafes where experts donate their time to fix people’s broken items for free at a designated repair event (usually run by community centres, churches or councils – the Tahunanui Community Centre is one such example). If your electronics really have given up the ghost, rather than chucking them out, take them to the Nelson Environment Centre to be recycled – the centre recycles a huge range of electronics, making it the regional hub for e-waste recycling. It will come at a cost to you (until the Government starts to regulate manufacturers of these products), but it’s a small cost relative to damage these items otherwise cause in landfill. NOTE that the Nelson City Council currently offers a $20 subsidy towards e-recycling costs (available until June 2018) to Nelson residents. Nelson Environment Centre and Resource Recovery Centre – NEC is a mecca of great environmental work for the Nelson-Tasman region at large! Apart from the Kai Rescue and E-recycling services it runs, mentioned above, it also houses the Nelson Reuse & Recycle Centre, which is doing a fantastic service diverting large amounts of stuff from going to landfill through its two Reuse shops. If you’re ever in need of a new one-off purchase (from a home fit-out, cuts of wood, through to cutlery or appliances), consider coming to shop here first, before going to buy something new. You might be amazed by what you find (and the low cost). The centre also does a weekly tender for vintage/unique/valuable items. Tahunanui Community Centre – this community centre is buzzing with activities that help to reduce waste, from sewing and upcycling activities, through to community gardens, hosting Boomerang Bags sewing bees, and running projects such as Fix-It cafes (get your broken goods fixed by people with the know-how, rather than chucking them out or sending them straight to recycling). Check them out if you live nearby! Menzshed – there are Menzsheds throughout the Nelson-Tasman region. Menzshed provides a great opportunity for men of all ages to share tools and a workspace (reducing the wasteful overduplication of these resources) and to pass on skills of woodworking and other trades. Menzsheds frequently offer communities the service of repairing broken items like furniture (at a small cost), and also creating bespoke items for community and charitable purposes. Definitely look up your local! What to do with wood off cuts? Don’t landfill wood if you can avoid it! You can take off cuts to your local resource and recovery centre for reuse/resale rather than landfilling, or your local Menshed will probably welcome them too. Look out for local artists who might be keen to take it on as well. For example, if you’re near Murchison, local carver Hohepa Barrett at The Carving Shed will happily take it from you – even MDF! Community gardens – community gardens are an excellent way for residents to get kai without packaging, and to learn skills of growing food and setting up composts – both very useful skills for low-waste living. There are community gardens dotted around the region, but there’s an absolute cracker one in Motueka – definitely worth checking out! Community gardens are always looking for volunteers to help out and come along to working bees, so if you are interested in picking up gardening skills, or if you are already a keen gardener and would like to have the opportunity to share your skill with others, consider getting involved with your local community garden. Community Share Motueka – share skills and services without the exchange of money, using timebanking or talents. This is a great way to reduce waste on a budget, harnessing skills of creating and repairing in your community, or having someone pass these skills on to you. We understand that there is a Nelson Timebank starting up? If anyone is able to pass on information about the best way to get involved in this, please leave a comment below! Our Kai Motueka – having access to locally-grown food is a great way to get food without packaging and reduce the waste associated with transporting food great distances. Our Kai Motueka is a group focused on the production, distribution, consumption and celebration of local food. Frequently the group will make posts about excess locally-grown food that is up for grabs, or will pick/harvest local food to share with those who need it. Our Kai Motueka also shares information about sustainable food systems and is constantly developing ways of encouraging the growth of food locally – a great network to be a part of! Crafty Tarts – Crafty Tarts is a local group in Motueka who love crafts and sewing and meet weekly to share skills and promote the joy of crafting through friendship and involvement in community projects. Beginners/newbies and old-timers are all welcome. Crafty Tarts is a great way to develop vital skills that help in reducing waste (sewing, mending, darning, knitting, crochet), and the group has frequently been involved in projects to create items that help others to reduce waste, such as sewing bags for Boomerang Bags, or sewing reusable lunch bags and sandwich bags. So great! Boomerang Bags Nelson and Boomerang Bags Motueka – an excellent initiative spreading across the country that equips people to avoid plastic shopping bags by making cloth bags available at stands in local stores and supermarkets (look out for these around town!) These bags are sewn by volunteers at sewing bees around the region. If you are interested in sewing bags then get in touch with the local Boomerang Bags team in your area. Even if you don’t know how to sew (yet) there are things you can do, and it’s probably a great way to learn too! Motueka Cupcycling Initiative – striving to make Motueka disposable takeaway coffee cup free, Steph Fry of Celcius Coffee has launched the cupcycling initiative where you pay a one-off $10 at a participating cafe for a coffee and the ongoing use of a Cupcycling cup. You can then take that dirty cup to any other Cupcycling outlet and get your next coffee in another clean reusable cup. If you’re a local and you don’t already have a reusable coffee cup, and you support this initiative, then get amongst it the next time you get a coffee in Motueka, and ditch the disposables for good 🙂 As Fry notes, if you can make it work in Motueka, it could become a blueprint for other towns in the region, and the rest of the country, too! Dust & Rust, 35 Fairfax Street, Murchison – this place is so amazing. It has a real reduce, reuse, recycle ethos, where you can get lots of preloved treasures for sheds, garages, kitchens and the home. The owners are also really keen on salvaging materials that might otherwise go to waste and have helped locals and businesses build a few things round town out of upcycled materials. Definitely go check them out if you’re local and if you’re doing a home refurbishment or building something new at home, chat to them about whether they might have some upcycled materials you could use, or if they’d be interested in taking any materials that you are left with after the job. Murchison Playcentre – this playcentre is totally buzzing and has a zero waste kaupapa. Several of the parents involved have been sewing reusable cloth bags to be used as an alternative to plastic shopping bags and are always thinking up new ways of reducing waste in the community. They are also in the process of developing a community garden, which is an excellent way to get kai without packaging, while also passing on the skills of growing food and composting, which are really helpful for low-waste living. We totally recommend connecting with this excellent crew of parents to see if you can help out or get involved in any way.